Party People. Christopher Livingston. Photo by Jenny Graham. How do we create art about history? Can we make it powerful, relevant, and pedagogical? What happens when the people whose lives and struggles we portray are still alive – and in the audience? Anyone making art about the past has to come to grips with questions like these. But it’s rare to find artists comfortable enough with the practice of history to build an entire piece around answering them. 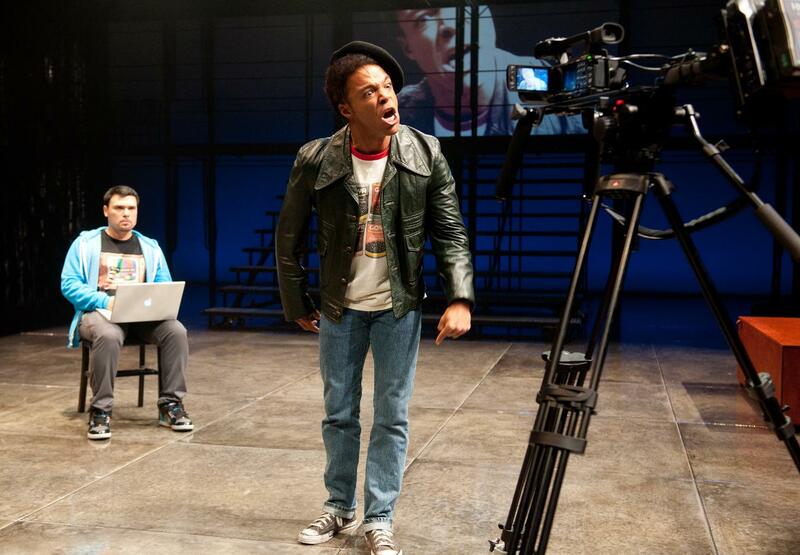 Bronx-based collective UNIVERSES does just that with the play Party People, which tells the story of the Black Panthers and Young Lords movements in the 1960s and early 70s. My partner and I saw Party People in July at the Oregon Shakespeare Festival (OSF), not knowing what to expect; in the end we enjoyed the play’s mix of acting, dancing, singing, rapping and multimedia. 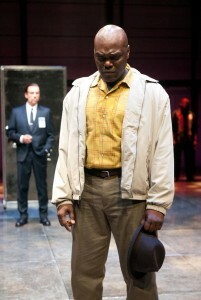 But what really caught my attention was the way the piece engaged with the complicated business of staging the past. 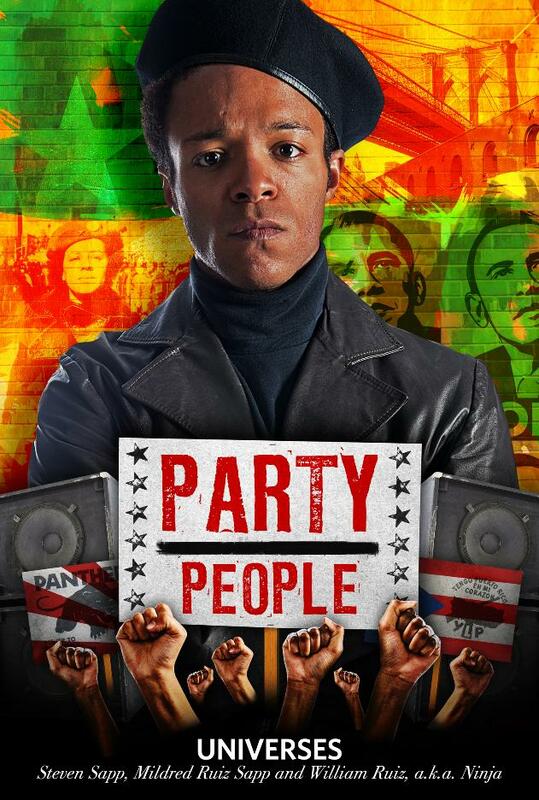 Party People is not just about the past, but also about how and why we remember it today. This is a play with a bibliography, the product of dozens of oral interviews with former members of the Panthers and Young Lords. 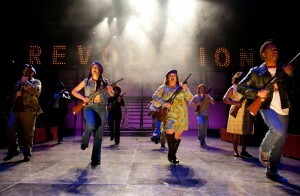 It was commissioned by the OSF as part of American Revolutions: The United States History Cycle, a series of plays funded by the Mellon Foundation about important moments in American history. Malik (Christopher Livingston) and Jimmy (William Ruiz, a.k.a. Ninja) prepare for the gallery and video installation event. Photo by Jenny Graham. Party People begins with artists Jimmy and Malik putting together the opening night of an art installation about the Black Panthers and Young Lords. They worry: are all the pieces going to arrive on time? Do they have the authority to make art about their parents’ generation? Are the former Panthers and Lords they invited going to get along at the event? Every few minutes, the past comes bursting in. Video projections, songs, and re-enactments are triggered by Jimmy and Malik’s preparations and the reminiscences of their guests. 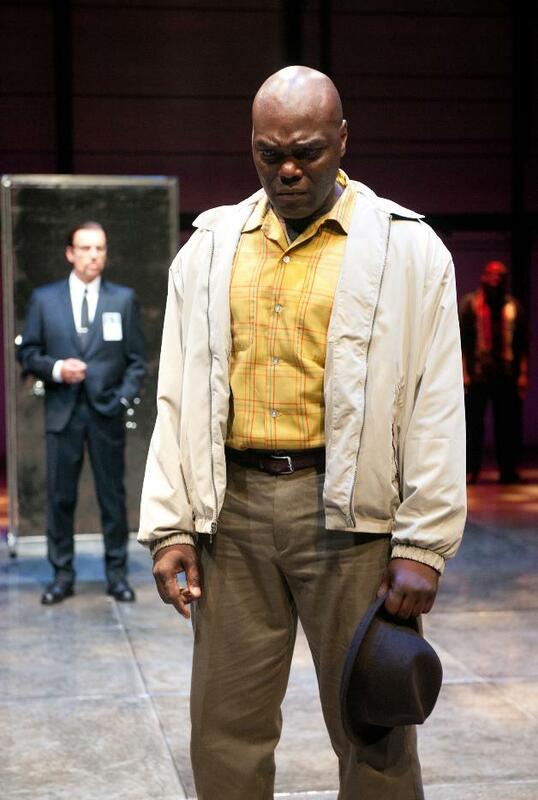 For example, a phone conversation with a former activist about the artifact he’s bringing to the show – the bullet-riddled door to the apartment where Panther Fred Hampton was killed by police in 1969 – turns into a series of vignettes about violence and police brutality. Panthers and Lords on the march. (Ensemble). Photo by Jenny Graham. Representations of the Panthers (the Young Lords aren’t media icons in the same way) often give prominence to their provocative style and the aura of violence that surrounded them. Party People is no exception, but the play does a good job at highlighting other aspects of Lords and Panther history, including the free breakfast programs both groups ran in their communities. Thanks to the oral testimonies collected by UNIVERSES, we learn that female members of the Panthers or Lords often faced sexism: they could be excluded from decision-making, and often were expected to cook, keep house and sleep with male members. Party People also provides an interesting segment on how the FBI’s counterintelligence program (COINTELPRO) used coercion and disinformation to sow suspicion within both groups. It’s clear that in this part of the play that UNIVERSES are using as sources not only oral interviews, but also the COINTELPRO documents. Flashback to a confrontation between a Panther (Peter Macon) and the FBI agent who ran him as an informant (Michael Elich). Photo by Jenny Graham. The story UNIVERSES tells is accompanied by an interesting commentary on their historical practice. For example, not everyone Jimmy and Malik invite to the opening remembers the past in the same way; participants have forgotten, or interpreted events in ways that make it easier to continue on with their lives. Two former Lords argue over who was actually present when the group occupied a Chicago hospital. And an ex-Panther who authorized the torture of a suspected informant has convinced himself that he had no other option, but the man who was tortured remembers differently. Rather than ignoring these contradictions in the historical record, Party People focuses on them, giving us a vivid discussion of some of the challenges faced by all practitioners of oral history. Another issue raised by Party People is the question of authority to interpret the past. Jimmy and Malik are trying to make sense of the struggles of their parents’ generation, so that people today can learn from their successes and mistakes. But they are faced with interviewees who doubt their ability – both as individuals and as members of the apathetic internet generation – to understand 1960s activism. The fact that they are related to ex-Panthers and Lords gives them a kind of insider status, but they still face the charge that “You had to be there to understand.” This is an issue that arises for many oral historians, and one that we can’t simply dismiss by claiming professional authority to interpret the past. UNIVERSES are sensitive to this. Their plans to tour Party People across the United States include hosting salons where Black Panthers and Young Lords will be invited to speak and engage in community dialogue. In the Q&A following the performance we attended, several members of the (mostly older) audience brought up their own 1960s experiences. In Party People, UNIVERSES manage to present both the results of their research and a critical discussion of their methodology in an accessible, entertaining format. Of course as an historian I would have liked more: more research, more detail, more nuance in their interpretation. But the fact is that UNIVERSES’ work is reaching a public of thousands this season in Oregon, and many more once they tour the show. These kinds of non-academic encounters with history and historical practice seem to me to be what active history is all about. Party People is just the fourth play – of up to thirty-seven – in the American Revolutions cycle at the OSF, and I’d say the series is off to an excellent start. Stratford Festival, I hope you’re watching. Daniel Ross is a PhD candidate in history at York University. His research focuses on the 1960s and 70s, and he is currently studying the history of cycling activism in Canadian cities.